In the past few years, Internet usage has continued to grow and evolve from its simpler web browsing and email origins. Now, for many organizations, internet is the cornerstone of business and because of this, companies are looking for more effective ways to utilize their technology while also cutting costs. Today, organizations need reliable Internet connectivity with increasingly higher speeds and many of these businesses are looking for cost effective alternatives. 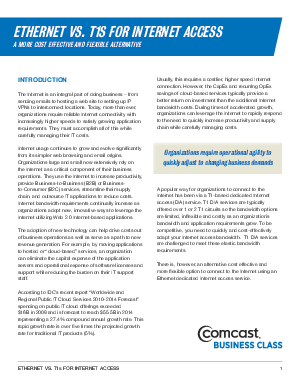 Download this whitepaper to learn how Ethernet dedicated Internet access service will solve all of these problems and more.